Manfrotto has expanded its video tripod range with two new twin-leg video tripods made of carbon fiber. Manfrotto, a division of the Vitec Group, said the two twin-leg video tripod models are for professional videographers looking for robust, rigid and lightweight support. A 50 percent increase in rigidity is achieved thanks to the combination of carbon-fiber tubes and a new patent-pending internal leg lock mechanism. Manfrotto’s two new twin-leg carbon-fiber video tripods are available in middle spreader and ground spreader models. Both feature a 100mm bowl with a 75mm aluminum adapter for compatibility with a wide range of video heads; adjustable and removable spreader allowing for precise positioning based upon the creators needs; and rubber feet with spiked option making them adaptable based on location. 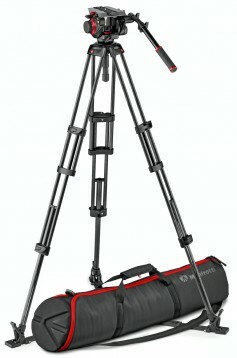 Manfrotto video tripods are all videographers looking for a solid support for their video shooting. Both twin-leg carbon-fiber tripods are available now in combination with Manfrotto Nitrotech N12, N8 and 504 video heads. Prices range from $699.99 to $1199.99.